Attention! This bugfix is only for Windows XP, Windows Vista and Win 7! Everything is set up, the cam delivers a Foucault shadowgram, the couder screen is visible but Auto Compare only shows a picture like this. This behaviour is often caused by hardware acceleration. When the cam is running, the image is actually displayed on a different surface/layer called overlay that is set up by hardware acceleration. When you now use Auto Compare, VCS can only access the normal surface where the image isn't displayed. That's why it comes out black as the cam-picture is invisible to VCS. Fix this behaviour by turning off hardware acceleration. You can either disable hardware acceleration locally in the application that is supplying the image (recommended in case the cam's driver software offers this functionality), or disable hardware acceleration system wide. 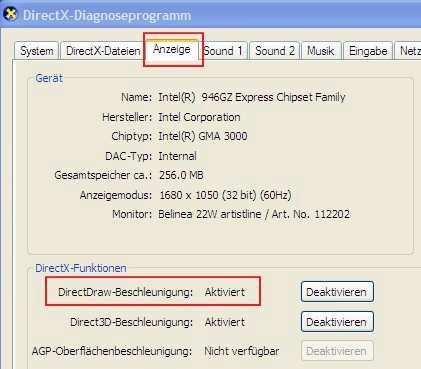 A way to check if hardware acceleration is activated is by running dxdiag.exe (delivered with Windows). Go to tab 'Display' and check if 'DirectDraw-Acceleration' is activated or not. Eventually you can (de)activate hardware acceleration in 'dxdiag' directly! Start > Control Panel > Display > Properties > Settings > Advanced > Troubleshooting and slide the Hardware Acceleration slider from Full to None. Click Apply and then click OK to accept the new setting and close the dialog box. Eventually any tool installed with your grafic card's driver provides a possibility to deactive hardware acceleration. Under http://www.3dcenter.org/download/directx-control-panel you will find a free download (only 125 KB). Additionally you need a packing program that can handle 7z-Format, e.g: 7-Zip. dxcpl_x86.exe for 32-bit or dxcpl_x64.exe for 64-bit systems. 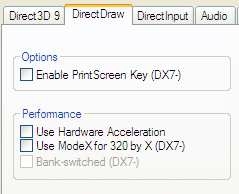 Then, in tab 'DirectDraw', uncheck 'Use Hardware Acceleration' in order to deactivate hardware acceleration. relaunch the cam's software or (to be sure) restart windows! The author has tested the (de)activation of hardware acceleration on several systems using both the windows-intrinsic functionalities as well as DirectX Control Panel without any problems. Despite that, the author assumes no liability for damages, direct or consequential, which may result from the use of the proposed functionalities and programs. The user must assume the entire risk of changing any system settings. Several windows or complete computer screen freezes. Sorry, this is a Windows bug. Applications that run perfectly in all current operation systems fail as soon as the Desktop is switched to 'Aero Design'. 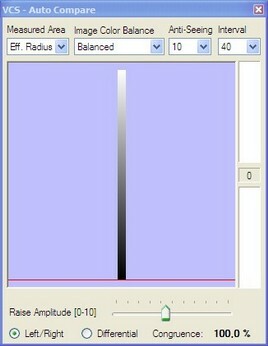 Especially 'Aero Glass' often causes severe problems in many programs. Normally this is sufficient to run VCS without problems. This sets the design to'Windows 7 Classic' and 'Windows Classic' respectively.